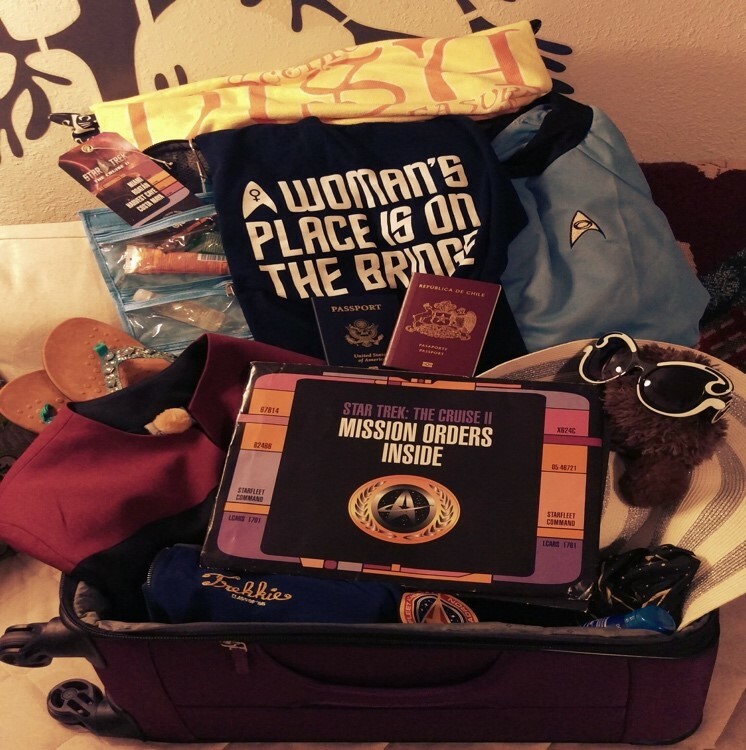 I am getting ready for my second Star Trek cruise and I am going to share my experience on what to expect, and what to pack. This time we booked at the very last minute; the first time I had more than a year to plan and organize, which soothed my anxiety. It made it easier to leave my comfort zone, I fear the unexpected and I worry about it. Like Saru, I was born ready to flee and I am always prepared for a predator. Before the first cruise, I read about the Sinking of the Lusitania, and the Zika outbreak; fortunately, torpedoes are unlikely and in winter there are no mosquitoes. I still worry about the political instability in Honduras (one of the ports during this trip) and I noticed the U.S. State Department site has a yellow travel advisory in place. The other weird thing I did before going last year, was to refresh my table manners. 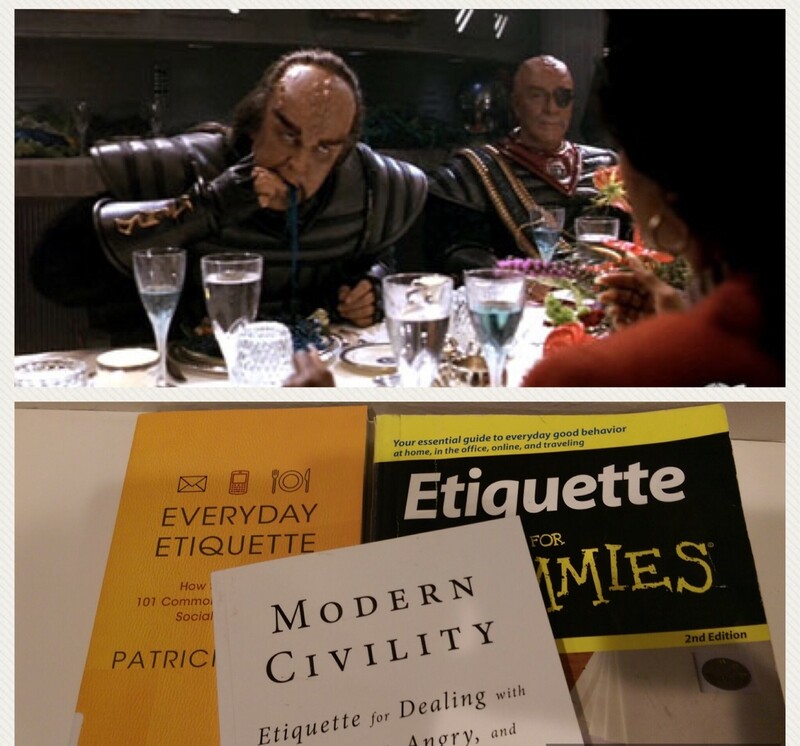 I read some etiquette books to be comfortable sharing our dinner table with others without feeling like too much of a Klingon. I think feeling up-to date with human protocols worked for me to ease my social awkwardness. I also paid special attention to the panelists attending, I read about them and decided I was interested in some of their publications. I took one of the books I previously purchased online and after the panel I asked for an autograph, I am now the proud owner of an autographed copy of Star Trek and Physics by Dr. Lawrence Krauss. If you have never cruised before, remember to make time to rest and relax; although it is true that going to unfamiliar places and facing new experiences is nerve racking, we must boldly go, and I assure you this risky business of vacationing is worth it! My experience interacting with everyone was amazing, all the cruise-goers will be fun, kind, polite and eager to enjoy Risa. Keep in mind though, it is a massive vessel, and there are many of us sharing the same space, long lines, and unavoidable waiting is to be expected. What you need to pack the most is patience, for others, for the crew, for yourself! If you are flying to Florida, from abroad or from another state, arrive a day earlier to Miami to avoid delays due to winter storms, also become familiar with TSA rules: the same rules apply for the cruise ship. Check what not to pack in your carry-on here. In addition, weapon prop replicas are not allowed on board, so leave your phasers and Bat’leths home. A day prior to sailing, at the Hilton Miami Airport, there is a Meet-and-Greet organized by a Star Trek Facebook cruise group. I attended last time and I am planning to go this time again; it was a fun, very packed informal meeting where I met two wonderful Trekkies and hosts of another amazing Star Trek podcast, “The Starboard Power Coupling” (mature content). Matt and Ken were great, and as a fan of their podcast I can’t wait to see them again next year! The day of embarking, your luggage tags with your name and cabin number need to be attached to your suitcase. When you get to the port you will encounter a somewhat hectic process, a porter will take your luggage and they will deliver it to your cabin later. It is customary to tip the porter. Keep your carry-on bag with your valid passport, valuables, and whatever you need during the first hours on the ship with you, since you will not have access to your cabin immediately after boarding, nor to your luggage for a couple of hours. Carry a light jacket, your medicine, your cell phone and charger, and your swimsuit if you are planning to go to the hot tubs or swimming pools. Be ready for long lines during the process of checking in, besides showing your tickets and passport, you need to get a picture ID issued by the cruise line. You need to look like your normal, human self, that’s why no face paint, prosthetics or Vulcan ears are permitted. There are a couple of hours you will spend waiting before embarking – I am taking a book or if I recognize someone from the previous night’s Meet-and Greet maybe we will just talk! Next, groups will be called to embark. On the ship you will be allowed to certain areas (not to your cabin yet). This is a great time to get something to eat (food is included with your fare, except specialty dining) or something to drink (alcoholic drinks are not included with your fare,; you get charged per drink and pay it with your cruise ID card at the end of your trip). I used this free time to walk around and familiarize myself with the “boat” (as seasoned cruise goers call this massive vessel) these are useful terms to find your way: Aft/forward: The back of the ship is aft and the front of the ship is forward. These terms are used as adjectives, such as “aft balcony cabins” or “Ten forward.” Bow/stern: The front part of the ship is called the bow, while the back is is called the stern. Muster drill/muster station: A muster drill is a mandatory event where passengers assemble in a specific location and receive instructions on what to do in an emergency. The muster station is the location passengers must go to during a drill or in an actual emergency. I have watched Titanic, and The Poseidon Adventure, so pay attention. OBC: Onboard credit – a credit added to your onboard account, either as a perk of booking or as compensation for an unforeseen event. Port/starboard: The nautical terms for left (port) and right (starboard). You can remember because both “left” and “port” have four letters. Tender: A small boat that ferries cruise passengers from the ship to shore when docking isn’t possible. Latinum matters. I have a budget and it includes some US one-dollar bills for tips – although gratuities are included with your fare, sometimes a tip for exceptional service is necessary. I left a tip to my cabin steward because we accidentally spilled syrup on the white bed cover (I was mortified). To carry your stuff, a fanny pack or a more stylish travelers’ money bag comes in handy. Don’t carry all your money with you, your cabin has a safe. Because I did not purchase celebrity guided tours, autographs, pictures, nor specialty dinner I have no advise for you except: stick to your budget! I also pack earplugs and a night mask. I strongly suggest taking an air refresher for your tiny and unventilated cabin bathroom; your cabin mate will thank you! The bathroom comes with an all-purpose liquid soap dispenser in the shower and next to the sink, so I was glad I took my own shampoo and conditioner. You can store your luggage under your bed for extra room, use the laundry line in the shower to hang your wet swimsuit, and I suggest you invest on an over the door hanging organizer for toiletries, make up, hair brush, since there is not a lot of counter space. Because irons and steamers are not allowed on board, I am packing a wrinkle release spray this year. The cabin has a blow dryer and few outlets for your electronics, but if you need to charge and use more than one device, pack a power splitter. Last cruise, the level of excitement and happiness was so high that by the end of the day we were exhausted, we skipped shows, panels and most of the theme parties because we fell asleep – the most expensive naps of our lives, yet we had a great time! When preparing for the voyage home, use the same packing list so you leave no Tribble behind. Be patient with lines and crowds, enjoy, relax, stay in budget, take care of yourself and see you in Risa! Your roommate may thank you for air freshener, unless they have a fragrance sensitivity like me. If you must have it, bring an eco-friendly brand. Loved the advice in this blog. Just to add – I found the dispensers in the shower were fine and I didn’t need any additional shampoo or conditioner. Unless you have specific needs, this might save you a little weight in the luggage. We’re going on the Jan 5, 2018 Star Trek Cruise and attempting to get answers from the entertainment co that’s hosting with no reply. We see there’s a “dress up (cozplay)” or “formal attire” dinner with Sulu. As it’s worded we interpret this as one or the other. We only have Star Trek shirts as cozplay. I wouldn’t expect to take formal attire on a tropical cruise, but not sure! My guy and I need to know if formal attire for this dinner needs to be packed, or our shirts cozplay enough. Also, do we need to pack our own beach towels for the port of call beach excursions or are those provided, and if so at what cost? Hello Denise, There is not an actual dinner, it is more like an outdoor party with finger foods and some complementary drinks. No strict formal attire is required (unless you love to dress up, then Go ahead!) but I saw most people wearing Gala cosplays (like the white dress uniform from “Star Trek Nemesis”) some wore their IRL military formal uniform (Like Austronaunt R. Seafood) I saw cocktail dresses and tuxedos and polo shirts and jeans: Your shirt cosplays are enough! All themed parties are on the top deck under the stars, everybody stands up next to the swimming pools, and they start around 22:00 hrs, they are crowded, informal and there are a lot of people wearing costumes (I saw Mugatoes and Gorns!!) Last year I changed into my uniform of the day before dinner and went to dinner and shows wearing my costume/cosplay. The Gala night fell on the same day we did our vows renewal and I wore my white TNG gala uniform and took many pics wearing it, this next trip I will be wearing a TOS science blue dress with MOD 60’s make up, not very gala-ish but I want pictures in a different uniform. No need for beach towels, they have a station next to the swimming pools where you can get them and another to return them, or leave them in your cabin. I am not sure about taking them off the ship, since I didn’t go to the beach excursions, I would advise you to call the customer service for Norwegian Cruiseline they are most helpful and nice, I do for all my detail questions, they might not know about panels and activities especific to the Star Trek cruise, but it’s their crew and ship and same rules apply for their company and they have excellent customer service. You are going to have so much fun Denise! I can’t wait to spend a week with of you amazing Trekkies! Reyen ~ Thanks so much for easing our mind and all the helpful information. One more question since you’ve been on this cruise before: Laundry service off the top of your head? Yes or no? If not known we’ll ask the cruise line. 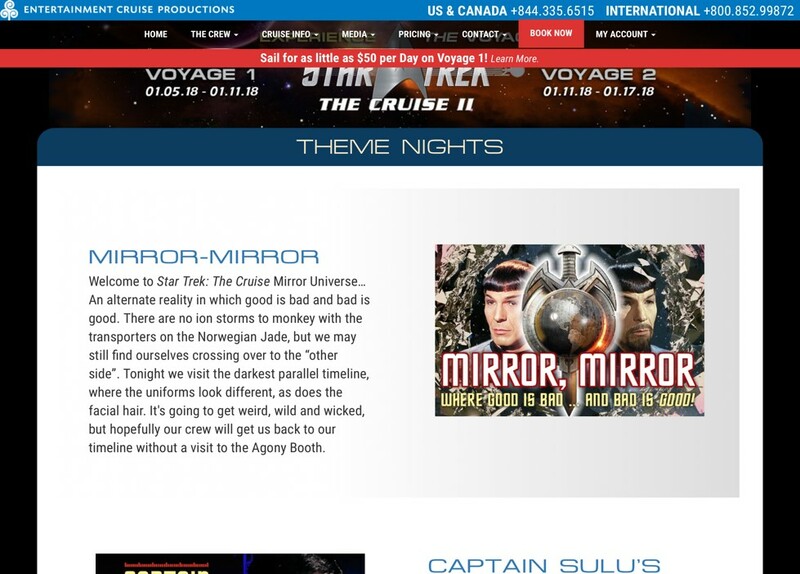 We so look forward as well to making epic memories with fellow Trekkies! Happy New Year! This is SO helpful! First time cruiser, so I am hanging on every word! Great info. This is the first cruise for both my girlfriend and me so thanks for the pointers. Now I know to unpack my steamer and find some wrinkle spray before my flight to Miami. Is there cell service on the cruise?